Taking the Arrow Out of the Heart NPR coverage of Taking the Arrow Out of the Heart by Alice Walker and Manuel Garcia Verdecia. News, author interviews, critics' picks and more. 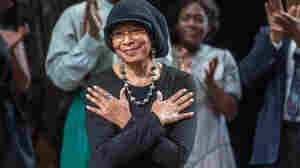 The award-winning author of The Color Purple returns with a collection of nearly 70 works of poetic free verse, presented in both English and Spanish, that focus on issues of love, hope and gratitude in our troubled times. October 6, 2018  The author of The Color Purple has released a new book of poems. Written in English and translated into Spanish, it's called Taking the Arrow Out of the Heart.